Ceremonies for Inspiration and Meaning. Ceremonial has been an important part of human life since time immemorial. In the Round Table we use ceremonies for a number of reasons. They help children develop intuition, imagination and a sense of spirituality. They impart a deeper sense of the universe around us. They also help teach the importance of cooperation and group work. Ceremonies communicate the ideals of the ancient wisdom to children through their own understanding. They receive spiritual impulses and learn to translate these into action. Not least, they are beautiful, inspiring and moving. We perform many symbolic ceremonies, including the Flower Ceremony, the Light Ceremony and the Sword Ceremony. We also use ceremonial to dramatise legends, such as the search for the Grail, which represents the search for Self. The symbols used in the Round Table are simple and beautiful so that even very small children are touched by their meaning and magic. The empty chair of the King symbolises that which the individual holds to be the highest. The Knights of Love, Strength and Wisdom symbolise the qualities we need to develop in our search for the Grail, that chalice form which symbolises man as an open channel for spiritual strength. The lighted candle reminds us of that light which is within each one of us; and the Light in the East, the One Universal Light from which it comes. The circular form of the Round Table is the symbol of equality and brotherhood; and the Sword a symbol of strength (Will) used in the service of the World. Our ceremonial features many symbols, all taken from the legends of King Arthur. Although simple in themselves, the symbols may be interpreted in many ways, allowing children to use their own imagination. 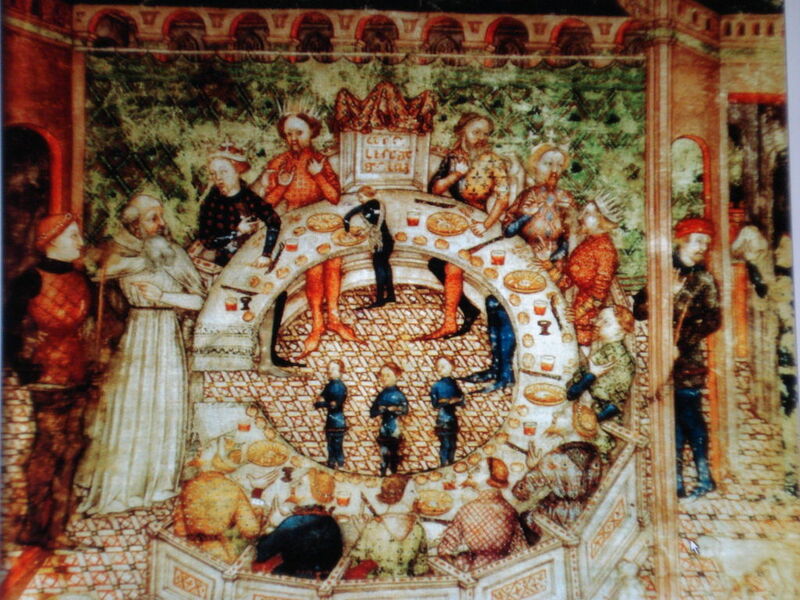 The Round Table - this was a wedding gift to Arthur from Guinevere. It can be seen to represent the Queen, the feminine, life and growth. It features at the centre of every ceremony. The Circle - with no beginning and no end, continuous, infinite and eternal. King Arthur sat at a circular table with his knights to signify that all are equal and so we always form a circle in our ceremonies. The King’s Chair - is a focal point of all Round Table ceremonies; but it is empty so that each person may visualise their own ‘King’ or perfect ideal. The Star - a five-pointed star above the King’s Chair represents the Universal Light. The Lighted Candle - is a reminder of that part of the Universal Light that is within us all. Galahad brought to the King's Court by a hermit (Merlin?). From a 12th Century Syrian manuscript. Copyright © 2018 The Trustees, The Order of the Round Table in England (Charity Number 1118034). All Rights Reserved.